Well, you do if you’re a voice talent and your name is Morgan Freeman, anyway. The White House seems to have played its hand as to its preferred network news organization. Not to point out the obvious, but if they’re inviting announcers for CBS News programs, I think CBS News forgot somebody. With the switch to HD, networks and local stations are not only sprucing up their sets (and their talents – make up doesn’t work the way it used to), they are also updating their graphics package. So Monday, CBS’ Early Show did just that…complete, I’m advised, with a new announcer. I am open to correction but it sure sounds to me like the lovely and talented Mr. Beau Weaver scored himself another network gig. Sounds great to me. In addition to the discussion on this blog, I have found discussions on VO-BB and Voiceover Universe about the change from Walter Cronkite to Morgan Freeman as the announcer for The CBS Evening News with Katie Couric. I was and am not in favor of the change. As I noted in one of the discussion threads, not a lot of exciting stuff happens in our industry so when something like this comes around, it’s a 7 on the Voiceover Richter Scaleâ€¦and yeah it’s a little bit pathetic. “More doing and less talk about doing,” you might say and you’d be right. But one email note on the Voiceover Universe discussion kind of disturbed me and it came from the site’s creator/owner, the fine voice talent Zurek. That “one man” would be Morgan Freeman and the quote concerns me because of my active participation in this debate. Let me again say as I thought I have specifically said many times â€“ the focus of my comments are why it is valuable to keep Walter Cronkite’s voice associated with the network’s flagship news program. I really couldn’t care who got the job under the current circumstances which I felt/feel does not merit any change at all. If CBS’ decision on the announcer is “cast-in-stone-final” and Morgan Freeman is their choice, OK. I have no other horse in this announcing race (which obviously wasn’t much of a race â€“ a compliment by CBS News’ execs to Freeman’s recognized acting abilities). If anyone felt that my comments were a negative reflection on choice of Freeman – that was not my intent and I apologize if I was not clear enough on that point. It’s whether there is a true need for change in this circumstance that I believe makes the opportunity for debate relevant to the voice over community (and probably very few other people 🙂 ). And if you have a blog post, no matter the topic, one better expect, nay, hope for a debate. It’s what makes a blog post a true blog post. Tonight, “The CBS Evening News with Katie Couric” changed the news program’s opening; the graphics were the same but the voice was different. 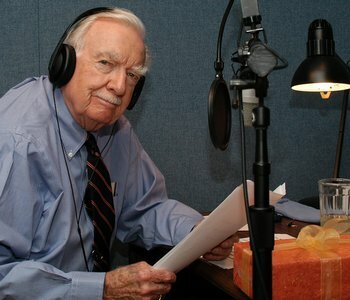 The network’s most celebrated anchor (even more than Edward R. Murrow) Walter Cronkite had introduced the network’s flagship broadcast since it began in September of 2006. It was a masterful piece of casting. Tonight, CBS News President Sean McManus and Executive Producer Rick Kaplan used a new voice to introduce the program, actor Morgan Freeman. Here is the audio for the new introduction. Mr. Freeman did a passable job as an announcer and it’s said he’ll voice other CBS News programs as well, adding unity and flexibility to many CBS News broadcasts. But Freeman is not Walter Cronkite whose voice upon that program bestowed a blessing and implied gravitas the likes of which cannot be measured by anything yet invented. No other network news program had or has anything like it. Suffice it to say Cronkite’s voice over on the program’s open was an invaluable asset. McManus had indicated the program would lose Cronkite’s voice on the open in 2009 after the anchor man died but the Cronkite family allowed it to be used ever after, which (it was said at the time) made everyone happy at CBS News. The stupidest thing The CBS Evening News with Katie Couric ever did occurred tonight â€“ it removed a pillar of broadcast journalism as the voice of the network’s primary news program and replaced it with someone else. It is not Freeman’s faultâ€¦no one could have replaced Cronkite’s perfect voice over. UPDATE: With thanks to @VoicesDotCom via Twitter where I first saw this new news posted, the family of Walter Cronkite has told CBS News this morning that it would an honor to have the voice of the late news legend remain as part of the “CBS Evening News with Katie Couric”. Read about it here. As you might guess, I LOVE this decision. You don’t think any of them read the blog post below earlier this morning, do you? Nah, nobody reads this digital rag! That’s the news, now for an opinion. CBS News President Sean McManus said “it didn’t feel right” to continue to use Cronkite’s voice after his death. I understand the sentiment, I get it and I respect it. I think you’re giving up the best newscast intro ever voiced â€“ there was so much implied by his voiceover in addition to his great and immediately recognizable delivery. I would also hate to be the man or woman who is chosen to follow that man as the new announcer. Dan Rather wasn’t wise enough to really understand what a tough act Cronkite would be to follow when he lobbied for the “CBS Evening News” anchor job in 1981. Most announcers aren’t that oblivious. Iconic CBS News anchor Walter Cronkite died today at the age of 92. The newsman died of cerebral vascular disease at 7:42 p.m. ET in his New York City home surrounded by his family. CBS News was the standard for television news during Walter Cronkite’s tenure. After he left, the place was never the same. He saw the country through the Kennedy assassination and the national mourning that followed and Man walking on the moon (I’m especially disheartened he’ll miss the 40th Anniversary of that monumental event this coming week). He reported on the Vietnam War and of a Presidential resignation following something called Watergate. I didn’t know him, I knew of him. I watched him. Everybody did. My only connection to him was when I bestowed on him an honor I am pretty sure he never heard about: the best voiceover performance of 2006.